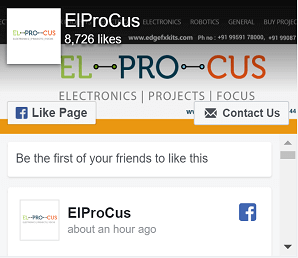 Opto-isolators or Opto-couplers, are made up of a light emitting device, and a light sensitive device, all wrapped up in one package, but with no electrical connection between the two, just a beam of light. The light emitter is nearly always an LED. 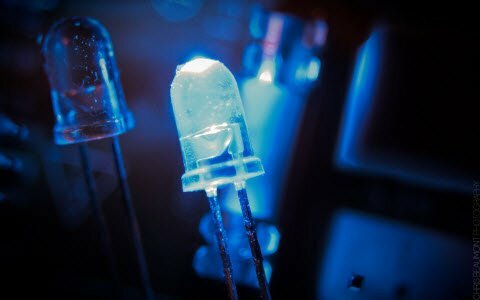 The light sensitive device may be a photodiode, phototransistor, or more esoteric devices such as thyristors, TRIACs etc. A lot of electronic equipment nowadays is using opt coupler in the circuit. An opt coupler or sometimes refer to as opt isolator allows two circuits to exchange signals yet remain electrically isolated. This is usually accomplished by using light to relay the signal. The standard opt coupler circuits design uses a LED shining on a phototransistor-usually it is a npn transistor and not pnp. The signal is applied to the LED, which then shines on the transistor in the IC. The light is proportional to the signal, so the signal is thus transferred to the photo-transistor. Opt couplers may also comes in few module such as the SCR, photodiodes, TRIAC of other semiconductor switch as an output, and incandescent lamps, neon bulbs or other light source. Most commonly used is an opto-coupler MOC3021 an LED diac type combination. This IC is interfaced with a microcontroller and an LED is connected in series to the IC, which glows to indicate a logic High pulse from the microcontroller so that we can know that current is flowing in internal LED of the opto-IC. When logic high is given current flows through LED from pin1 to 2. So in this process LED light falls on DIAC causing 6 & 4 to close. During each half cycle current flows through gate, series resistor and through opto-diac for the main thyristor / triac to trigger for the load to operate. This is the principle used in Opto−Diacs, the Opto-Diacs are available in form of ICs and can be implemented using a simple circuitry. Simply provide a small pulse at the right time to the Light Emitting Diode in the package. 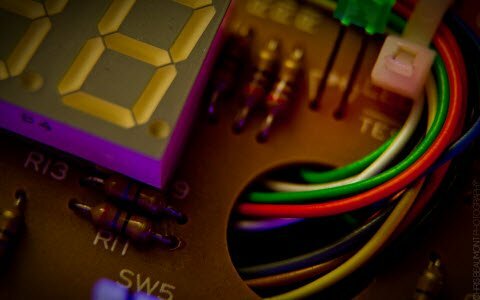 The light produced by the LED activates the light sensitive properties of the diac and the power is switched on. The isolation between the low power and high power circuits in these optically connected devices is typically several thousand volts. The MOC3020 are designed for interfacing between electronic controls and power triac to control resistive and inductive loads for Vac operations. 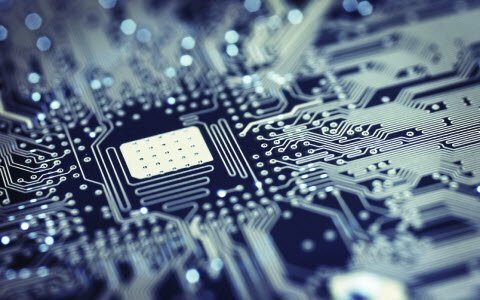 The principle used in opto-coupler is, MOC’s are promptly available in integrated circuit form and don’t require very complex circuitry to make them work. Simply give a small pulse at the right time to the LED in the package. The light produced by the LED activates the light sensitive properties of the diac and the power is switched on. 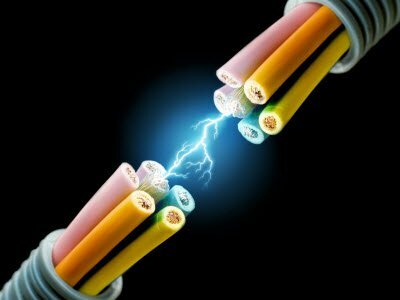 The isolation between the low power and high power circuits in these optically connected devices is typically few thousand volts. The circuit shown below is a typical circuit used for AC load control from microcontroller, one LED can be connected in series with MOC3021, LED to indicate when high is given from micro controller such that we can know that current is flowing in internal LED of the opto-coupler.The idea is to use a power lamp whose activation requires mains AC as opposed to a DC voltage. That’s way, the mains AC power that we’re trying to switch the lamp and no external power supply is required. 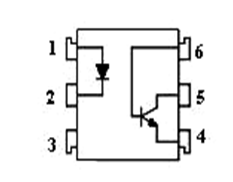 To switch the AC current to the lamp, we have to use an opto-coupled triac, lamp and a diac is shown in circuit below. A triac is said to be as an AC controlled switch. It has three terminals M1, M2 and gate. 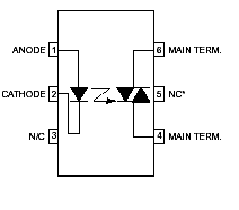 A TRIAC, lamp load and a supply voltage are connected in series. When supply is ON at positive cycle then the current flows through lamp, resistors, diac, and gate and reaches the supply and then only lamp glows for that half cycle directly through the M2 and M1 terminal of the triac. In negative half cycle the same thing repeats. Thus the lamp glows in both the cycles in a controlled manner depending upon the triggering pulses at the opto isolator as seen on the graph below. If this is given to a motor instead of lamp the power is controlled resulting in speed control. 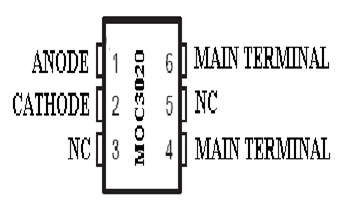 MOC3021 is an opto-coupler designed for triggering TRIACS. By using this we can trigger anywhere in the cycle, so can call them as non-zero opto-coupler. MOC3021 are very widely used and can be quite easily obtained from many sources. It comes in 6-pin DIP shown in figure. 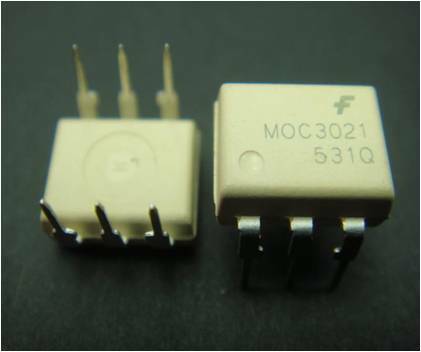 There are many applications of MOC3021 such as solenoid/valve controls, lamp ballasts, interfacing microprocessors to 115/240 Vac peripherals, motor controls and incandescent lamp dimmers. From the below circuit, the most commonly used is an opto-coupler MOC3021 with an LED diac type combination. Additionally while using this with microcontroller and one LED can be connected in series with MOC3021, LED to indicate when high is given from micro controller such that we can know that current is flowing in internal LED of the opto-coupler. When logic high is given then the current flows through the LED from pin 1 to 2. So in this process LED light falls on DIAC causing 6 and 4 to close. During each half cycle current flows through gate, series resistor and through opto-diac for the main thyristor / triac to trigger for the load to operate. The MCT2E series of opto-coupler devices each consist of gallium arsenide infrared LED and a silicon NPN phototransistor. They are packaged in a 6-pin DIP package and available in wide-lead spacing. It is a combination of 1 LED and a transistor. Pin 6 of transistor is not generally used and when light falls on the base-emitter junction then it switches and pin5 goes to zero. 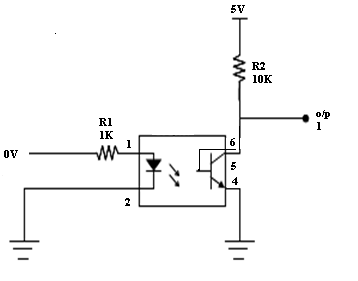 When logic zero is given as input then the light doesn’t fall on transistor so it doesn’t conduct which gives logic one as output. 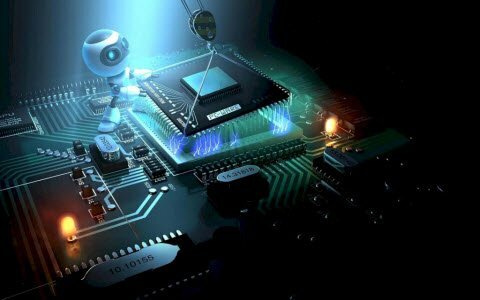 When logic 1 is given as input then light falls on transistor so that it conducts, that makes transistor switched ON and it forms short circuit this makes the output is logic zero as collector of transistor is connected to ground. From the circuit, we have an opto-coupler MOC3063 with an LED SCR type combination. Additionally while using this opto-coupler with microcontroller and one LED can be connected in series with MOC3063 LED to indicate when high is given from micro controller such that we can know that current is flowing in internal LED of the opto-coupler. When logic high is given then the current flows through LED from pin 1 to 2. 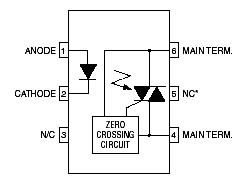 The LED light falls on SCR causing 6 and 4 to close only at the zero cross of the supply voltage. 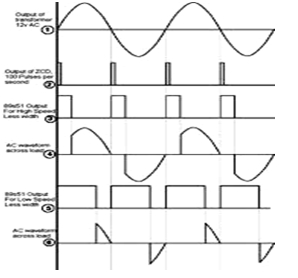 During each half cycle current flows through SCR gate, external series resistor and through SCR for the main thyristor/triac to trigger for the load at the beginning of the supply cycle always to operate.